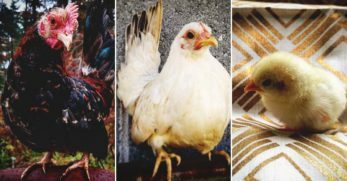 Orpingtons are one of the most popular chicken breeds that have been raised and loved for many years. 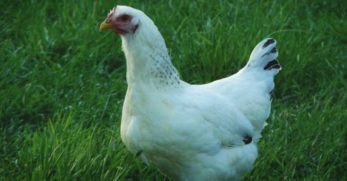 The Orpington chicken breed is very versatile with good egg laying and meat production qualities, as well as exceptional maternal capabilities. Orpingtons also make for wonderful pets and companions for children because of their gentle nature. 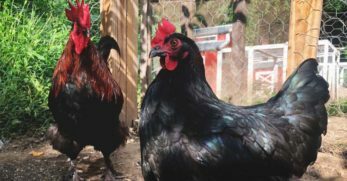 The first color variety of Orpington was a Black Orpington bred by William Cook in England. 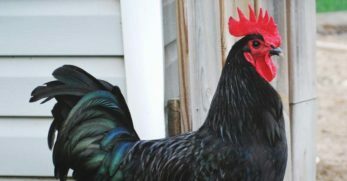 Cook created this breed by crossing Plymouth Rocks, Minorcas, and Langshans; his end goal was to create a black bird to hide the soot of London. Orpingtons were shown at Madison Square Gardens and from there they gained popularity quickly. Today black, buff, blue, splash, and white Orpingtons have been accepted into the standard of perfection. Orpingtons are rather large in comparison to other breeds. 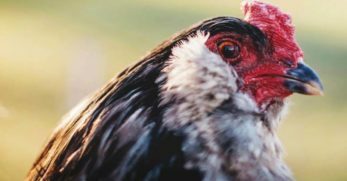 Hens typically average about 7 lbs for a healthy, mature bird. 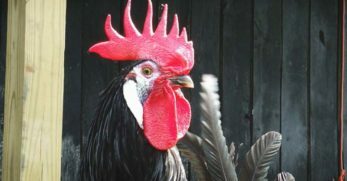 Roosters are about 8.5 pounds when full grown and healthy. These birds often appear larger than they really are because their feathers are very fluffy. Do not be intimidated by their large size, these birds are some of the most docile ones around. 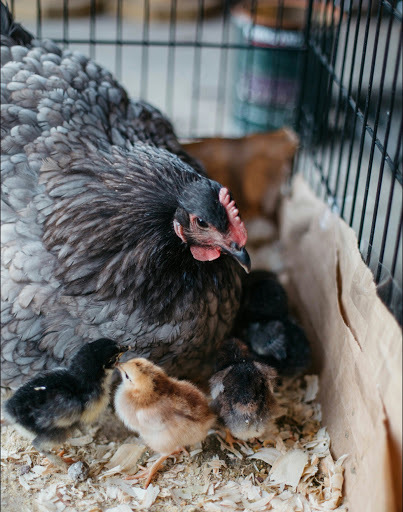 Orpingtons frequently go broody and make some of the best mothers in the chicken coop. 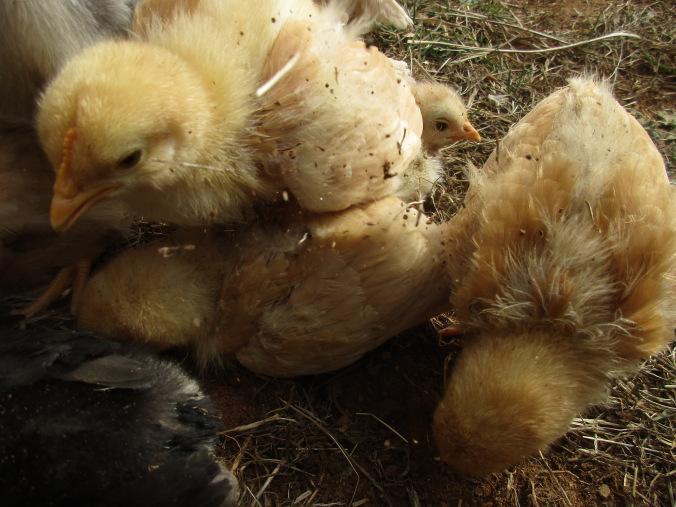 Many small children choose Orpington hens for their sweet personalities and patience with being handled. I like to refer to them as the puppies of the chicken run because they love to follow me around. 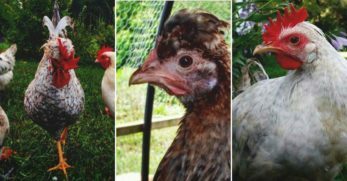 Despite the sweet and affectionate character of Orpingtons hens, I do recommend keeping a wary eye on Orpington roosters. These boys seem to have a streak of bad blood in them from time to time. 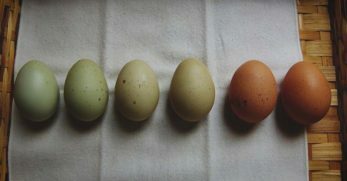 Orpingtons have decent egg production, especially for a larger breed. 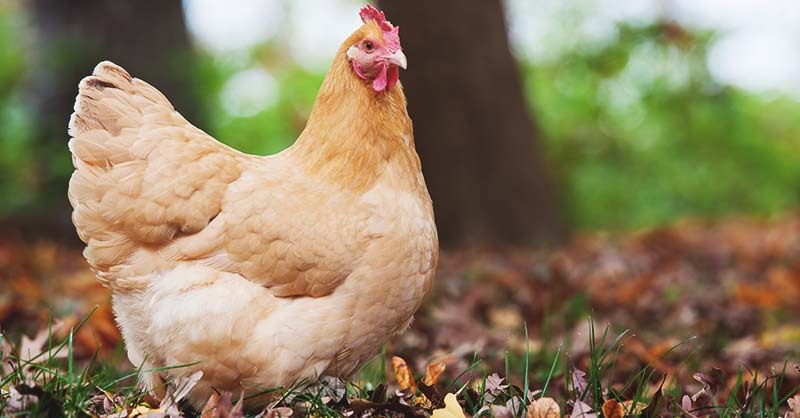 Orpingtons can be expected to lay about 190 large brown eggs annually. 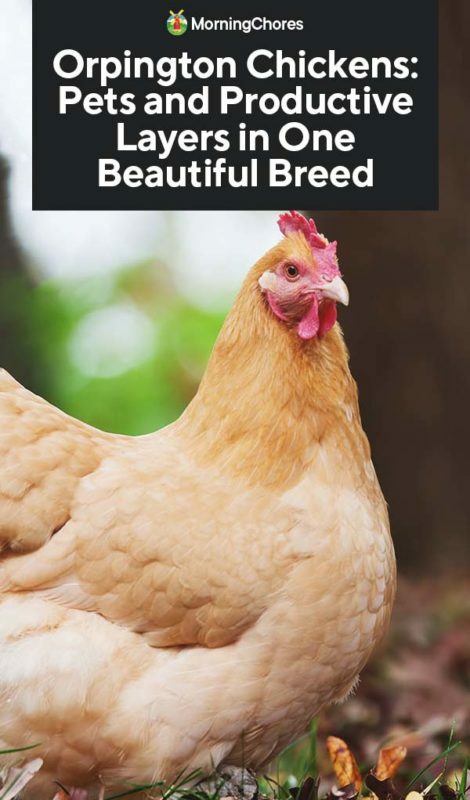 This breed is a dual purpose breed, so they provide a decent amount of meat. 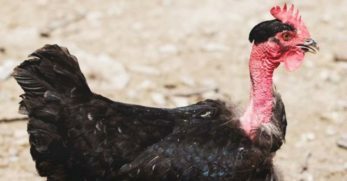 As with many heritage breeds, they are a slower growing bird, so do not expect a plump bird ready for slaughter in 8 weeks. I recommend waiting until about 6 months of age for the optimal meat quality and overall size of the carcass. Orpingtons are rather cold hardy birds. In the proper conditions, they can withstand some very frigid nights. 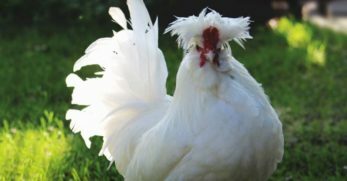 Since Orpingtons have a single comb, roosters with especially large combs are easily prone to frostbite. The key to preventing frostbite is making sure your birds have adequate housing in which they can escape from the elements. On the other side of the cion, Orpingtons can fare well during hotter weather as well. Always see to it that your birds have shade and fresh water. 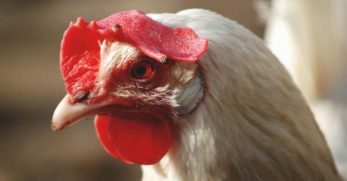 Especially during hot months, it can be necessary to check frequently to make sure your birds are doing well. Orpingtons do not require any different diet than the rest of your flock. Laying feed can be found in just about any feed store. Make sure to supplement extra protein during a molt to ensure the growth of strong and healthy new feathers. 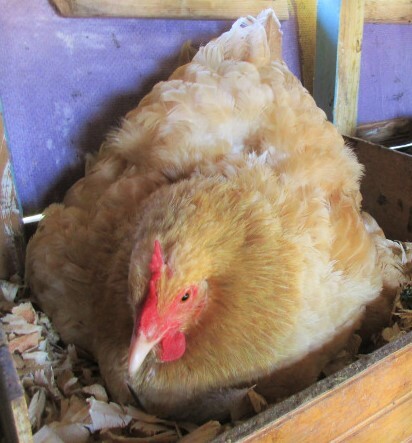 Since Orpingtons are a larger breed, I recommend a little bit of extra space in the coop and run for them. You don’t really need to worry about them flying the coop because they are not very inclined to fly since they are big birds. Orpingtons have proven to be a fun bird to breed. 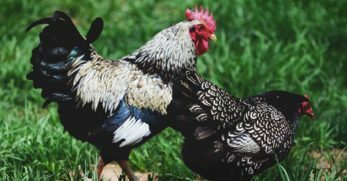 Many people like to use Orpingtons for playing around with crossbreeding since they have many admirable traits to pass on to your new hybrid. My personal favorite was crossing an Ameraucana to an Orpington, that was an interesting combination. 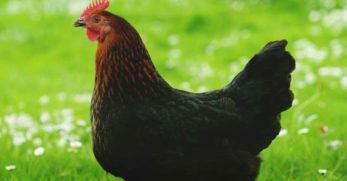 Do you like the idea of Orpingtons but have your doubts about acquiring this breed? Perhaps I can suggest some alternatives I have found to be comparable. Cochins make a nice alternative to Orpingtons for many reasons. 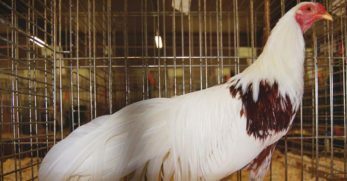 This breed can be found in similar color varieties and they have similar maternal traits to Orpingtons. Both breeds are very calm and friendly with similar climate preferences. Wyandottes are also a dual purpose breed with a decent annual production. 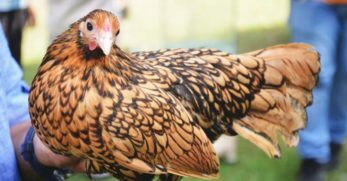 These birds can be found in slightly different color varieties, but the laced color varieties of Wyandottes are stunning. Wyandottes are not quite as broody as Orpingtons, nor are they quite as sociable. However, Wyandottes are capable of withstanding cold weather, as Orpingtons do. Australorps are very similar in looks to Orpingtons, though they do have slightly less fluff. 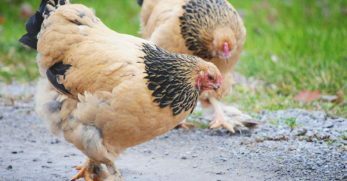 These are very friendly and calm birds with a tendency to go broody. 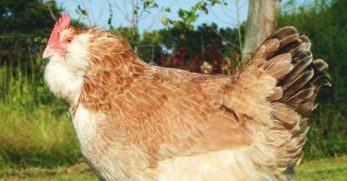 This breed has an excellent egg production, laying a large brown egg almost daily. 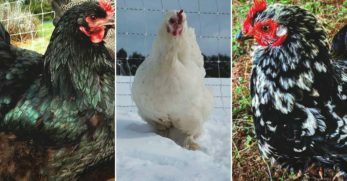 Despite the fact only blue, black, splash, buff, and white Orpingtons have been accepted into the standard of perfection, there are several other color variations. These varieties include silver laced, golden laced, red, jubilee, lemon cuckoo, and lavender. However, you may have to do some searching to find these colors and don’t expect them to be cheap when you do! 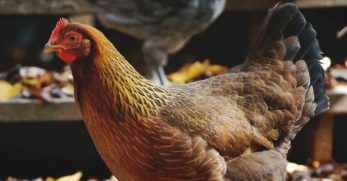 I have found these birds a joy to raise, with their friendly and curious personalities paired with their wonderful abilities to rear chicks they make a great addition to your chicken coop. It never grows old seeing a bunch of fluffy chicks following their even fluffier mama around the yard.